Pioneers in the industry, we offer ultra-clean dry mop and micro dust mop from India. This Dry Mop comes with the ultra-clean thread quality that attracts the dust from any surface and holds it for a better and hygienic cleaning, Acrylic thread quality is the finnest among others. 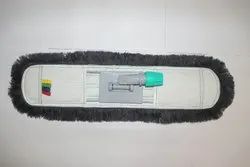 Micro dust mop uses Indian micro-fiber refill which helps clean even the micro dust particles to give the most hygenic cleaning experience, such refill types are most advised for hospital and hotel premises for higher hygiene requirements. Looking for DRY MOPS ?